As the outrages pour out of the US daily, or seemingly hourly, good people's shock and horror are often accompanied by feelings of frustration and helplessness. Far too many well-intentioned organizations are lining up around the midterm elections, as if the answer lies only at the ballot box. Many people are organizing locally to support rallies, demonstrations, letter writing, and the like. Still, the frustration is palpable -- and understandable. These actions, although important, feel so insufficient. The current US government shows no sign of respecting the rule of law or popular opinion, and certainly not morality. One concrete action we can take to resist the Trump agenda is to support military resistance. Whenever and wherever fascist governments have perpetrated crimes against individuals and against humanity, they have been enabled by the loyalty of the militaries at their commands. "We were just following orders." This was the answer famously given by Nazi officers on trial for war crimes in Nuremberg, Germany after World War II. The civilized world rejected that answer, and the Nuremberg Principles were created to enshrine that rejection in international law. Unfortunately -- the most unfortunate thing in the world -- most military personnel the world over do not resist. But some do. And those courageous soldiers are fighting on the frontline for peace and justice. Military resistance is the most direct blow to the outrages perpetrated by immoral governments the world over. Resistance is a lonely road, and one that comes at a very high price. Ask Chelsea Manning. Ask Kim Rivera, who -- deported by the Canadian government -- gave birth to her youngest child in a military jail. War resisters need financial support, and they need moral and emotional support. And other soldiers need to know that resistance is possible. As with any groupthink, it's easier to speak out when others have gone before you. This summer, what might have been the defining low point of previous administrations, was simply the outrage of the moment: A plan to have the military host massive concentration camps of upward of 200,000 immigrant detainees across the United States, as we reported to you in July. These camps do not appear to be going up as quickly nor on such a massive scale as first announced (quite possibly due to the resistance on many levels), but they do appear to be moving forward. On the Texas border at Tornillo Port of Entry, a tent city that first detained a couple hundred children a few months ago will hold nearly 4,000 kids by the end of the year. Few people actually join the military to travel to distant lands to kill people. Fewer still join to help run concentration camps. 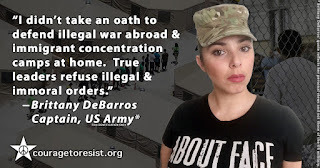 Under both US and international law, military personnel have a moral and legal obligation to refuse to comply with any order that involves collaboration with these camps, but unfortunately few are aware of this fact. These camps are illegal and immoral. You have a responsibility to refuse and expose these orders. Direct military resistance is powerful. Our initial goal is to raise $20,000 to spend approximately one penny per member of the US military with this challenge. Of course, we believe that service members deserve two cents worth of encouragement if we can raise $40,000! Just the idea of these massive military-hosted immigrant detention camps brings back memories of the forced relocation and incarceration of 120,000 Japanese Americans during World War II. Many of us thought something like that could never happen again, and yet, here we are. Along with everything else you can do to resist this affront to humanity, please support our challenge to military personnel to refuse these illegal orders. Your tax-deductible donation of $50 or $100 will make a huge difference. Click here to learn more, or to donate to the Do Not Collaborate campaign. The truth is, in the US, there was no choice. There's the party of cats or the คาสิโนออนไลน์ แจกเครดิตฟรี 2019party of cats. Another awesome athlete protest that I have no time to write about. I can only thank Colin Kaepernick for his courage. Joy of Sox speaks for me: To Mookie Betts (And Others): The Right To Protest Has Nothing To Do With The Military. Many years back, I used to blog about a phenomenon called fascist shift. I borrowed the term from Naomi Wolf's essential The End of America, but the concept was something I had been thinking about for many years. In brief, fascist shift asks, What if we're all looking for jackboots and Sieg Heil and tanks rolling down Pennsylvania Avenue, and while we're keeping our eyes peeled for a scene from a black-and-white newsreel, a different brand of fascism moves in and sets up shop? 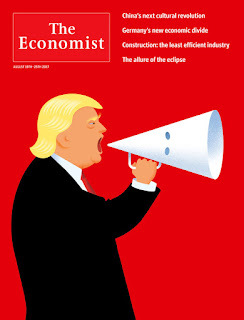 What if today's fascism is more insidious and less obvious - and what if it's dressed up in a democracy costume? What if while you're saying That can happen here and But they wouldn't do that, it already has, and they did. When you scroll through Wolf's ten indicators of fascism, are there any not seen in the US? And have any of them been repaired or reversed under Obama? Not a one. Now, though, Donald Trump's presidential bid and the many millions of Americans who support him bring America's fascist shift into better focus. As always, I am completely blocking out all US electoral politics. I don't know anything about the campaigns, because I already know everything about them, without knowing a single detail. If you've followed one US election campaign since 1980, you've followed them all. They only change by a matter of degree: they get worse and worse. Nothing has changed in the intervening years. Including all the voters who seem not to understand what is happening. Bernie Sanders running as a Democrat is ultimately a betrayal of everything Sanders says he stands for. And if he ran as an independent and tried to build a movement, he'd be vilified by the people who now praise him, and everyone who dared vote for him would be accused of electing the Republican. Such is the tragedy of the American left. And despite Trump's performance in the primaries, I still believe, as I have all along, that the Republican National Party will not give the nomination to Donald Trump. I don't think the corporate oligarchs that control the duopoly parties want a clown as their figurehead. I don't know (or care) how they'll manage it, but my lack of imagination will not impede them. It looks like the RNC has decided to sit this one out, as each party does from time to time. They can run a weak candidate, and simply let Hillary Clinton win. And why not? A Hillary Clinton presidency will be every bit as Republican as the Republicans. It's a win-win for the corporate masters. But this doesn't mean I don't recognize the significance of Trump's campaign. Trump - not the man, but the performance, and the audience's reaction to it - is a milestone of sorts. 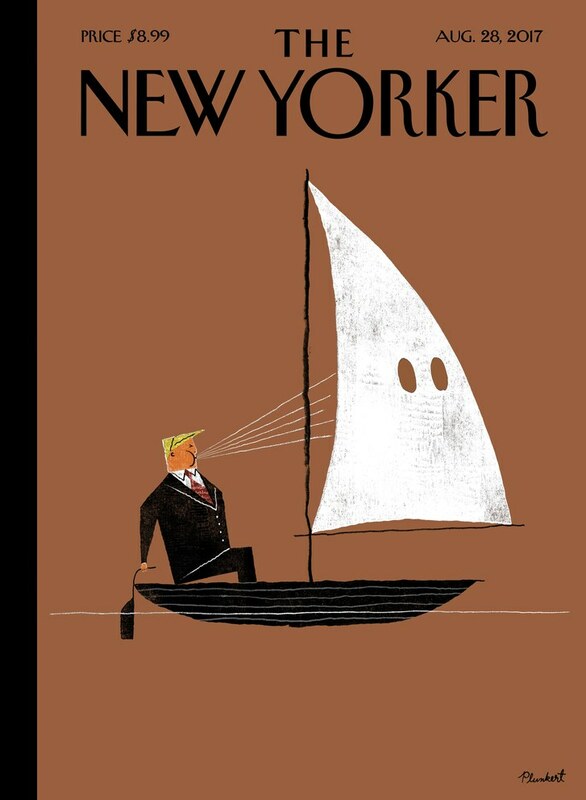 Trump is American fascism unmasked. In a discussion on Facebook, a friend wondered when was the last time a presidential candidate from a major party spoke about hatred and bigotry in such bald, uncoded terms. The most recent example we could think of was George Wallace. (Todd Gitlin had a similar thought.) That's going back a ways. I may have forgotten some gems from Michele Bachmann's campaign, but Bachmann never commanded the attention that Trump now enjoys, garnering a full 23 times the media attention given to Sanders. The US and Canadian media are enthralled. What will he say next? How far will this go? His entire campaign is one long vamp for the camera. The mainstream Canadian media (and Canadians who look to those sources) seem to take the US at face value. The skepticism and caution applied to Canadian politics ends at the (Democrat) White House door. Trump's open racism and bigotry shocks them, because Obama! They seem not to recognize that all the hatred of Obama and the worship of Trump are fueled by pure, undiluted racism. Much of the white working class - with no decent jobs, no bright future for their children, and no rescue in sight - cannot abide that a black man represents their country, and sits in a position of authority over them. The subtitle of this Barbara Ehrenreich piece says it all: "Downward mobility plus racial resentment is a potent combination with disastrous consequences." Progressive USians know that both institutional and personal racism have never gone away. But, as someone said in that same Facebook conversation, for the last 40 years or so, most politicians have trained themselves to speak in code or to keep their mouths shut. But all the while, O'Reilly, Coulter, Limbaugh, Beck (and so on) have been stoking that hatred, keeping their audiences primed and ready. Now Trump comes along to cash in. 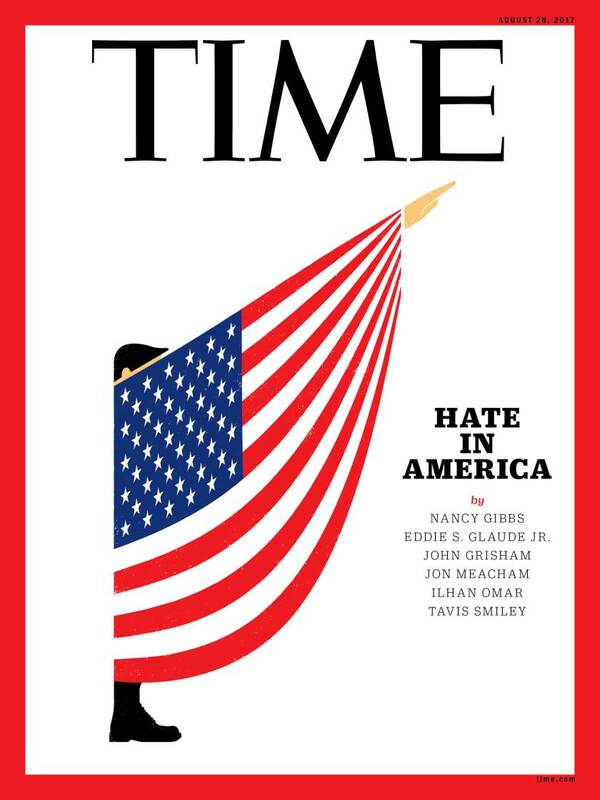 For me the surprise is not that so many Americans rally around hatred, bigotry, xenophobia, and violence. The surprise is that so many people are surprised! How did you all not know this about the US? A country founded on the genocide of its original inhabitants, built by slavery, justified by conquest, and made rich and powerful by imperialism. The United States, where property rights and the rights of the ruling class are sacrosanct above all, including human life. For all its fears of communism (then) and terrorism (now), the US has only ever been in danger of takeover from fascism. On the long list of anti-democratic policies the majority Harper Government has enacted, the Orwellian-named Fair Elections Act ranks near the top. More properly called a voter suppression law, the Act effectively disenfranchise tens of thousands of Canadians. The Council of Canadians has taken the issue to court, including an ongoing Charter Challenge, but those won't affect the upcoming election. That means there's only one way to lessen the effects: voter education. Last night at the Malton Library, we contributed to that effort, with #VotePopUp, a voter education program for new Canadians. Some weeks ago, I learned that one of our libraries had hosted this program, and jumped onboard. I worked with an amazing community organizer, who has a bit of funding from Samara Canada and Elections Canada, and copious amounts of know-how through the Peel Poverty Action Group and her own nonprofit, Building Up Our Communities. I promoted the program through various community organizations in Malton, and by chance it was scheduled on the same night as a newcomer ESL class, known here as LINC: Language Instruction for Newcomers to Canada. These programs have been hit hard by Conservative and Liberal budget cuts (do you see a pattern here? ), but thanks to dedicated teachers and social workers, they survive. So last night, 39 adults crowded into a room in the Malton Community Centre to talk about voting. Why vote? Am I eligible to vote? Where do I vote? What ID do I need? How do I mark the ballot? ... and a few dozen similar questions were answered. Many of the students have voted in their original countries and are very keen to do so in Canada. Many of their original countries make voting much easier; others, more difficult. The program is completely nonpartisan, of course. By another excellent coincidence, there is an all-candidates meeting in Malton tonight, the night following the program. We were able to distribute flyers and explain what would happen at that meeting. The presenter had prepared a mock ballot, and students chose the issue most important to them: jobs, transit, education, healthcare, and so on. Jobs won by a landslide. Using that, I was able to demonstrate how this would tie in with an all-candidates meeting: "What will your party do to bring more jobs to my community?" The library is the perfect place for a program like this. Our customers can use free, public computers to register to vote or look up their polling station. They can ask experts for free (and friendly!) help. They can use their library cards as a piece of voting ID. The public library is all about democracy and levelling the grossly unfair playing field. Voter education is naturally a piece of that picture. I've just finished two truly excellent works of nonfiction: Wild and Zeitoun. Both books read like fiction, with clean, clear writing and page-turning suspense. Both document almost unbelievable, out-sized events, in one case likely unique, in the other - horribly - anything but. I highly recommend both books. 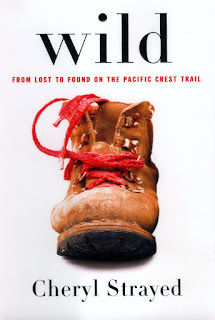 Wild: From Lost to Found on the Pacific Coast Trail is a story of perseverance and redemption. Her life unhinged, battered by loss and confusion, the author decides to undertake a wilderness backpacking expedition. This is no casual walk in the woods; she's chosen a trail for which experienced backpackers may spend a year in training and research. Strayed is completely inexperienced and almost comically unprepared - comic, that is, if the consequences of failure weren't potentially life-threatening. At several points in the book, I thought, "Well, she must survive, because she wrote this book...". Wild is suspenseful, moving, sad, uplifting, heartrending, and joyous. I was filled with wonder at this woman's strength, tenacity, and resilience. Wild left me contemplating that potential in all of us. Zeitoun is also a nonfiction page-turner. It's almost impossible to write about Zeitoun without spoiling it, and the way in which the story unfolds gives it tremendous power. Perhaps most people reading this review already know the terrible punchline. 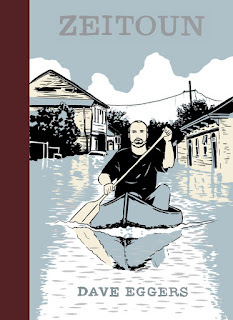 Zeitoun is the story of one man's, and one family's, ordeal during and after Hurricane Katrina. It is a story that sits at the intersection of two American nightmares: Katrina and the post-9/11 police state. It is an answer to every person who feels "police state" and "fascism" are hyperbole when applied to the United States. In truth, that depends on your zip code, your skin colour, and your last name. Considering I last visited New Orleans in 1992, I have a strangely personal relationship with Hurricane Katrina. August 30, 2005, the day Katrina hit New Orleans, was one of the most momentous days of my life: the day my partner and I moved to Canada. As with any move of this magnitude, we were unplugged from the world - no TV, no internet - for a couple of days before, and at least two days after. When we were back online, I struggled to take in the magnitude of what had happened. No matter how much we read, I felt like I never caught up. In the 10 years since, in any story about the Katrina disaster, the dates jump out at me. I can picture us clearly, driving The World's Fullest Minivan, my beloved Buster between us, Cody hunkered in a cave in the back, starting our new life. Right at those moments, tens of thousands of lives were shattered, ruined, or ended. The Zeitouns' story is compelling, heroic, and deeply frightening. If you've ever been inclined to think, "That wouldn't happen here," or "But they would never do that", know that it did, and they already have. As with What Is The What, Dave Eggers is using proceeds from this book to fund many very important and worthwhile causes. I highly recommend picking up a copy. Tomorrow - Saturday, March 14 - there will be protests across Canada against Stephen Harper's latest assault on democracy and free speech - Bill C-51 ("The Anti-terrorism Act 2015"). While Harper states the bill would merely "criminalize the promotion of terrorism" and give the government the power to remove "terrorist propaganda" from the internet, left unanswered is who defines "terrorism" and "terrorist propaganda". The bill is written in such overly broad terms it could be applied to nearly anything the Conservative government wants to deem criminal. The introduction of C-51 comes on the heels of news that the Communications Security Establishment, Canada's spy agency, is operating a covert, mass surveillance program that monitors the online activities of millions of Internet users around the world. Ron Deibert, a professor at the University of Toronto, likened the CSE program to a "giant X-ray machine over all our digital lives. . . . Everything single thing that you do . . . is being archived, collected and analyzed." Amnesty International lists seven reasons to oppose C-51. Other groups endorsing the rallies include: Leadnow.ca, Idle No More Toronto, Toronto Coalition to Stop the War, Ontario Federation of Labour (OFL), International Association of Machinists & Aerospace Workers (IAMAW), Occupy Canada, and Greenpeace Canada. C-51 will expand the mandate of the Canadian Security Intelligence Service (CSIS) while also allowing the Conservatives to increase their crackdown on legal political dissent. Paul Champ, a civil liberties lawyer, said there are serious concerns that C-51 "is going to target not just terrorists who are involved in criminal activity, but people who are protesting against different Canadian government policies." Indeed, an internal RCMP report from January 2014, obtained by Greenpeace, reported that the so-called "anti-petroleum" movement is a growing security threat to Canada. C-51 would relax privacy restrictions, lower the legal threshold for police to obtain a warrant, and allow Canadian authorities to hold suspects without charges for as long as one year. The Toronto Star reported the bill would give 17 security agencies "access to any information in any government department on any Canadian". Elizabeth May, leader of the Green Party, has sharply criticized the bill, saying it would "allow the Conservatives to turn CSIS into a secret police force". After some initial waffling, NDP leader Thomas Mulcair has spoken out against C-51. Silencing of dissent appears to be one of the bill's main goals. When May asked the public safety and justice ministers during question period if C-51 could be applied to non-violent civil disobedience, such as blockading along a pipeline route, she did not receive a direct answer. Micheal Vonn, Policy Director of the British Columbia Civil Liberties Association, said C-51 "proposes an unprecedented expansion of powers that will . . . impose a broad chill on legitimate political speech". Harper and the Conservatives remain hostile to transparency and accountability. CSIS's internal watchdog was eliminated by the Conservatives in 2012 and C-51 offers little in the way of additional oversight. University of Ottawa law professor Craig Forcese says the Conservatives want to return to an era when the security services were free to engage in illegal, dirty tricks. He wrote that the bill creates a "secret jurisprudence on when CSIS can act beyond the law". We must speak out against such obvious anti-democratic activities and resist Harper's totalitarian measures. One month ago, something happened that should trouble us gravely. Something happened that people who believe in democracy and free speech and an independent media and civil liberties and human rights should find appalling and unacceptable. It's old news by now; anything that occurs one month ago is ancient history. I wasn't able to blog about it at the time, and in a way that is good. Events of great significance occur - our rights continue to shrink, governmental powers continue to expand, fascism and police states continue to be normalized - and we rarely have a moment to process one slippery step before we slide into another. On August 18, 2013, a man named David Miranda was taken into custody at London's Heathrow Airport. Miranda is the partner of journalist Glenn Greenwald. And Greenwald, you'll recall, is one of the two people with whom Edward Snowden entrusted his evidence of the massive domestic spy campaign being perpetrated by the US government, with the help of Microsoft, Google, Verizon, Yahoo, among other of the world's largest corporations. Miranda was detained for nine hours under "schedule 7", some fine print in the UK's sweeping so-called anti-terrorism laws that gives police broad powers and ordinary citizens little recourse. Throughout, Miranda was denied the right to his own counsel. He was not charged with an offense. Media he was carrying was confiscated, but we know that doesn't take nine hours to accomplish. As I said, I'm sure you read about Miranda's detention when the story broke in August, and I hope you are not so jaded that you merely shrugged, without finding it truly chilling. In any case, for the sake of this post, let's take a moment to think about it and let it sink in all over again. The government has a massive, secret program through which it spies - constantly and without cause or provocation - on its own citizens. Someone inside the survellience program courageously comes forward to reveal it. In doing so, the whistleblower risks everything. He must leave his country, must fight for sanctuary and safety, must start an entirely new life. This whistleblower, Edward Snowden, entrusts two people - one journalist and one filmmaker - with the evidence he has gathered. And the partner of the journalist is detained under anti-terrorism laws. On Sunday morning David Miranda, the partner of Guardian columnist Glenn Greenwald, was detained as he was passing through Heathrow airport on his way back to Rio de Janeiro, where the couple live. Greenwald is the reporter who has broken most of the stories about state surveillance based on the leaks from the former NSA contractor Edward Snowden. Greenwald's work has undoubtedly been troublesome and embarrassing for western governments. But, as the debate in America and Europe has shown, there is considerable public interest in what his stories have revealed about the right balance between security, civil liberties, freedom of speech and privacy. He has raised acutely disturbing questions about the oversight of intelligence; about the use of closed courts; about the cosy and secret relationship between government and vast corporations; and about the extent to which millions of citizens now routinely have their communications intercepted, collected, analysed and stored. In this work he is regularly helped by David Miranda. Miranda is not a journalist, but he still plays a valuable role in helping his partner do his journalistic work. Greenwald has his plate full reading and analysing the Snowden material, writing, and handling media and social media requests from around the world. He can certainly use this back-up. That work is immensely complicated by the certainty that it would be highly unadvisable for Greenwald (or any other journalist) to regard any electronic means of communication as safe. The Guardian's work on the Snowden story has involved many individuals taking a huge number of flights in order to have face-to-face meetings. Not good for the environment, but increasingly the only way to operate. Soon we will be back to pen and paper. Miranda was held for nine hours under schedule 7 of the UK's terror laws, which give enormous discretion to stop, search and question people who have no connection with "terror", as ordinarily understood. Suspects have no right to legal representation and may have their property confiscated for up to seven days. Under this measure – uniquely crafted for ports and airport transit areas – there are none of the checks and balances that apply once someone is in Britain proper. There is no need to arrest or charge anyone and there is no protection for journalists or their material. A transit lounge in Heathrow is a dangerous place to be. Miranda's professional status – much hand-wringing about whether or not he's a proper "journalist" – is largely irrelevant in these circumstances. Increasingly, the question about who deserves protection should be less "is this a journalist?" than "is the publication of this material in the public interest?" The detention of Miranda has rightly caused international dismay because it feeds into a perception that the US and UK governments – while claiming to welcome the debate around state surveillance started by Snowden – are also intent on stemming the tide of leaks and on pursuing the whistleblower with a vengeance. That perception is right. Here follows a little background on the considerable obstacles being placed in the way of informing the public about what the intelligence agencies, governments and corporations are up to. During one of these meetings I asked directly whether the government would move to close down the Guardian's reporting through a legal route – by going to court to force the surrender of the material on which we were working. The official confirmed that, in the absence of handover or destruction, this was indeed the government's intention. Prior restraint, near impossible in the US, was now explicitly and imminently on the table in the UK. But my experience over WikiLeaks – the thumb drive and the first amendment – had already prepared me for this moment. I explained to the man from Whitehall about the nature of international collaborations and the way in which, these days, media organisations could take advantage of the most permissive legal environments. Bluntly, we did not have to do our reporting from London. Already most of the NSA stories were being reported and edited out of New York. And had it occurred to him that Greenwald lived in Brazil? Whitehall was satisfied, but it felt like a peculiarly pointless piece of symbolism that understood nothing about the digital age. We will continue to do patient, painstaking reporting on the Snowden documents, we just won't do it in London. The seizure of Miranda's laptop, phones, hard drives and camera will similarly have no effect on Greenwald's work. The state that is building such a formidable apparatus of surveillance will do its best to prevent journalists from reporting on it. Most journalists can see that. But I wonder how many have truly understood the absolute threat to journalism implicit in the idea of total surveillance, when or if it comes – and, increasingly, it looks like "when". We are not there yet, but it may not be long before it will be impossible for journalists to have confidential sources. Most reporting – indeed, most human life in 2013 – leaves too much of a digital fingerprint. Those colleagues who denigrate Snowden or say reporters should trust the state to know best (many of them in the UK, oddly, on the right) may one day have a cruel awakening. One day it will be their reporting, their cause, under attack. But at least reporters now know to stay away from Heathrow transit lounges. The protection of national security secrets must never be used as an excuse to intimidate the press into silence and backing off from its crucial work in the clarification of human rights violations. . . . The press plays a central role in the clarification of human rights abuses. This is good, but useless. The forces that shape our world are increasingly decided outside any democratic body, whether in a G20 Summit or an arcane provision of a law that no one has read or debated. The UN's warning is a sneeze in a storm. UK journalist Philip Bump also explains why this should cause us concern, and points out a few people who care, and a few who don't. David Miranda, who was detained for eight hours and 55 minutes by British authorities over the weekend because they thought he was carrying NSA documents for The Guardian, is taking legal action against the government — a move that could crystallize the conflict between state security and journalism. The British government's conflation of journalism with terrorism in the case of David Miranda is problematic largely because journalism, like terrorism, is no longer performed by discrete, centralized entities. Instead, journalists and those performing journalism around the world operate in small cells or individually. You post a video of police detaining a suspect to your Facebook wall, and you're committing an act of journalism — one that authority figures may not see as subject to First — or Fourth — Amendment protections. In the battle with the security state, those who might commit acts of journalism have three choices: acquiesce, push back, or step away. Miranda, who is Guardian reporter Glenn Greenwald's partner, is choosing option two. The BBC reports that Miranda is taking legal action of an unspecified nature, challenging his detention and seeking to prevent the government from reading the information on the devices it collected. What that information is may only be known by filmmaker Laura Poitras, the person with whom it originated in Berlin, but there's little doubt it includes encrypted files related to the Snowden leaks. If the police believe that an individual is in possession of highly sensitive stolen information that would help terrorism, then they should act and the law provides them with a framework to do that. Those who oppose this sort of action need to think about what they are condoning. The most important word in that statement is "would." Not "could" help terrorism — a standard so loose that it might apply to millions of pieces of information and real-world objects. But "would." The British appear to be echoing the NSA's line that detailing how the government does its work is itself an aid to terrorists. (A claim perhaps undermined by the recent embassy closures.) It also appears to echo the argument made by the government in the Bradley Manning case: publishing information is aiding the enemy. Rising to the defense of the American government is Jeffrey Toobin of the New Yorker. Toobin was criticized for his critique of the Snowden leaks earlier this month; Tuesday's essay is a continuation of that critique. "To be sure, Snowden has prompted an international discussion about surveillance," Toobin argues, "but it’s worthwhile to note that this debate is no academic exercise. It has real costs." Those costs are literal — the NSA having to build new surveillance systems — and figurative: "What if there is no pervasive illegality in the National Security Agency’s surveillance programs?" Toobin states that there is "no proof of any systemic, deliberate violations of law" revealed by Snowden, then noting of the Post revelations about privacy violations that "it’s far from clear, at this point, that the N.S.A.’s errors amounted to a major violation of law or an invasion of privacy." Incidental violations of privacy law, averaging seven a day, are acceptable to Toobin, as a cost-saving measure. Those specific defenses aside, the intentions of the British authorities cannot be considered outside of the context of their behavior. Late Monday afternoon, Guardian editor Alan Rusbridger revealed the paper's encounters with British authorities over this information. In a weirdly archaic move, representatives of the government's intelligence arm forced the destruction of hard drives containing Snowden information, as though that limited their ability to travel. The authorities threatened Rusbridger, prompting the paper to decide to move its reporting on the topic out of the country. And then there's the treatment of Miranda himself. For eight hours, he was denied the right to his own counsel. The end result was confiscation of his electronic media, something that could have been accomplished in less than an hour. But, Reuters reported on Monday, that wasn't all that the authorities hoped to accomplish. One U.S. security official told Reuters that one of the main purposes of the British government's detention and questioning of Miranda was to send a message to recipients of Snowden's materials, including the Guardian, that the British government was serious about trying to shut down the leaks. The Columbia Journalism Review offers a broader sense of the effect on journalism — behavior performed by far more than just journalists. This is police-state stuff. We need to know the American government’s role in these events—and its stance on them—sooner rather than later. The founder of law site Groklaw offered her response to the government's surveillance systems in a post this morning. In short: she's closing the site. That's stepping away from the fight, and a natural reaction to intimidation. But only one of the three responses — acquiescing, pushing back, or avoidance — offers the hope of reform. And finally, for reference, The Guardian has an excellent page full of stories and links about what's at stake: The NSA files.